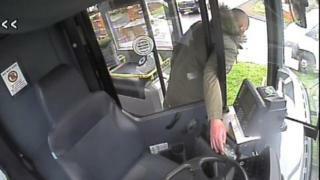 A thief stole £40 from a bus cash till while the driver went to the aid of a man having a seizure. Bus driver Kath Smith spotted a man lying face-down in water in Coral Place, Blackpool, during Storm Gareth on 12 March. She "instinctively" left the number three bus to help him, but as she did so an opportunist thief stole bus fares, Blackpool Transport said. When she handed in the takings at the end of her shift it was £40 down. Mrs Smith, who has been a bus driver for 18 years said: "You can see [the thief] putting his hand through the driver's screen and into the cab." It was reported to police the following day. Mrs Smith said she was "embarrassed" for the thief. "What will £40 get you? Hardly anything... and he's got to live with that." Lancashire Police confirmed it was investigating. There have been no arrests. Blackpool Transport presented Mrs Smith with flowers for her quick-thinking actions and said it was "very proud" of her. She said: "I did what anyone would do."